Bursaspor fans can now see daily progress on the Timsah Arena construction site. While the stadium has been in operation since late December, there’s still some work to be done and most noticeable changes in recent days include installation of the outer skin. Synthetic membrane requires stable temperatures to be mounted, so it was postponed during winter. And once it was put in place, discussion of the colour surfaced yet again. Single segments of the membrane have different shades of green and we were unable to establish whether this was actually planned or is the outcome of improper storage and dust. Regardless of the cause, growing green façade shows a lot better how the stadium will look once it’s finished. That said, there’s one major element we’re all waiting for, of course. The crocodile head attached to the north end already has its mouth in place and current progress level can be seen in the below aerial footage. 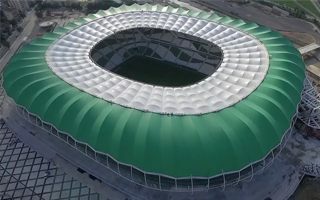 Using the opportunity, we took a look into how Bursaspor are managing to fill the large 43,000+ stadium. After all, it’s a major leap from the twice smaller Ataturk Stadium. And it turns out first games failed to meet 50% occupancy on average (20,258 per game). That said, it should be noted that only two games have been played with stands open to the public, none of them against the great Istanbul rivals and additionally Bursaspor is doing rather poorly in the league this season, currently occupying 10th place.